I myself am not quite sure just how the rubber chicken toy came about in the first place. Why a rubber chicken? Why not some other animal, like say, maybe a duck? Or how about a dog? 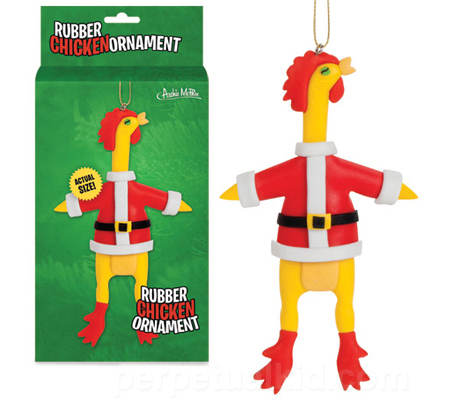 Well, since the rubber chicken has more or less entered mainstream consciousness for quite some time already, why not make the most of the situation with the $7.09 Rubber Chicken Ornament? It will show the world just what kind of sense of humor that you have with this particular Christmas tree ornament, instead of the usual glowing presents, Santa and his reindeer, and other Yuletide staples. Measuring around 5.5” in height, it is made out of plasticized vinyl.